His right brow cocked upward, a sly grin curved, Jon Gruden has no time for rumors. Still, scuttlebutt as to whether Derek Carr will remain with the Oakland Raiders has persisted in the aftermath of the Khalil Mack and Amari Cooper trades in 2018. However, for anyone and everyone who believes he doesn’t view Carr as the Raiders‘ quarterback of the future, Gruden does and he said just as much. "Yeah. He’s going to be our quarterback," Gruden told the NFL Network’s Jim Trotter at the Annual League Meeting. "I’m not going to address all the rumors. I could care less about the rumors. He threw for 4,100 yards. Threw for almost 70 percent in a very dire, tough circumstance. So I’ve got a lot of confidence in Carr; what he can do with Antonio Brown, with Tyrell Williams, with Trent Brown coming in here to help our offensive line." 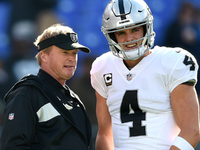 While Gruden doesn’t truck with rumors, he didn’t quell them either as he added that although he believes in Carr, the Raiders will still be sending personnel to meet with Oklahoma’s Kyler Murray and Ohio State’s Dwayne Haskins — quarterbacks projected for the first round in the upcoming NFL Draft. "Yes we are. We’re going to meet with a lot of guys at every position," he said. "We’re not going to look past anybody at any position. We have the fourth pick in this draft and we’re going to make sure we get it right." That fourth pick is the first of three in the opening round for the Raiders. They have also made a splash in free agency with the aforementioned signings of Williams and offensive tackle Trent Brown, among others, such as controversial linebacker Vontaze Burfict. And there was obviously the trade with the Steelers for Antonio Brown. Similar to his disdain for rumors, Gruden isn’t a fan of any talk about A.B. baggage — even though the one-time blonde-mustached wideout missed his team’s regular season finale, spoke of discontent with his former franchise and stated he did not need to play football unless it was via his rule book. "I don’t know what baggage A.B. has that you’re talking about," Gruden said. "He’s one of the most prolific receivers in football." No baggage? But what about that Week 17 stuff? "That’s in the eyes of the beholder," Gruden said. "I don’t think Brown has any baggage. I think that he is the real deal. He is exactly what this team needs. A go-to, clutch football player at a position that we needed. And we are so excited to have him. The energy that he brings to the practice field, the meeting room, his preparation is legendary." Prepare for the Raiders‘ final campaign in Oakland to be an entertaining one. Buzz and gossip aside, the Raiders are making moves before they move and only time will tell if Carr stays on to drive them or if Antonio Brown‘s luggage holds them back.